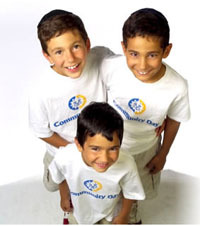 Community Day, an independent K-8 Jewish day school serving the Western Pennsylvania community, is dedicated to educating children from a wide range of Jewish backgrounds, practices and beliefs. We nurture the students’ curiosity, cultivate their imagination, and advance their initiative and critical thinking skills through a student-centered approach based upon a rich, integrated curriculum of secular, Hebrew language and Jewish studies. Students learn the spiritual, ritual and ethical precepts and practices of Judaism with an inclusive, egalitarian perspective and are infused with the joy and responsibility of being Jewish. Our goal is to provide our students with the tools to grow to their full potential as educated, committed and ethical members of society and with a strong bond to K’lal Yisrael (the Jewish People) and the State of Israel.